Before we go anywhere, the bed has to be perfectly straight, sinks wiped out, undies removed from the shower curtain rod and all valuables locked up or hidden away. We have vacuumed the floor so many times, it’s a miracle there is any fiber left in the carpet. Last week we accepted an offer to purchase. We were so relieved! Not that we were selling our house but that we didn’t have to prepare it anymore. We could relax a few days. Then we started thinking. What will the inspector find? Will the deal go through? How much will it cost? Where will we move? Should we start collecting boxes? We decided to wait until the inspection was over before we packed anything. That was mid-week and we’ve been on pins and needles ever since. Now the buyers have asked for paperwork we don’t have and we’ve placed calls to contractors to see what records they can provide for us. We’ve been put off until Monday. In an effort to diffuse the tension of uncertainty, we goofed off this weekend. We went to the movies. We took some melatonin and slept in. We ate out. Dan watered the hedges and I made bread. Monday we have commitments until 1:30, when we should find out if the required documents can be procured. We think we have sold our house and we think we’re going to have to move within thirty days. But we don’t know. These are tumultuous times. The preceding text was written two weeks ago. Since that time, we’ve solved a lot of problems and created new ones by shopping for a house to buy. We’ve learned mucho real estate lingo, talked to plumbers, foundation engineers, WDI inspectors (termite guys), lawyers, Realtors, movers and insurance agents. I guess I didn’t know what tumult was. Or uncertainty. We found a house. The House. We told our agent we were ready to make an offer. He would do it over the phone first, to see what the listing agent’s reaction might be. I began to pray. I wasn’t praying for him to accept the offer but I wasn’t praying for him to turn it down either. Houses, especially old houses, have problems. One will have termites but the next one will have tree roots in the sewer or a shifting foundation. These are all common in this part of the country and simply must be expected and dealt with. It’s scary. Our agent called to tell us there was already a contract pending on The House. Did we want to make a back up offer? Were we interested in the other houses he showed us? My husband texted from work: “Yes, yes, yes! I don’t want any other house. This is The House.” So we put ourselves next in line to buy, should the first deal fall through. I washed dishes while I prayed. Can life get any more uncertain? How much tumult can we endure? God, YOU decide which house and when! 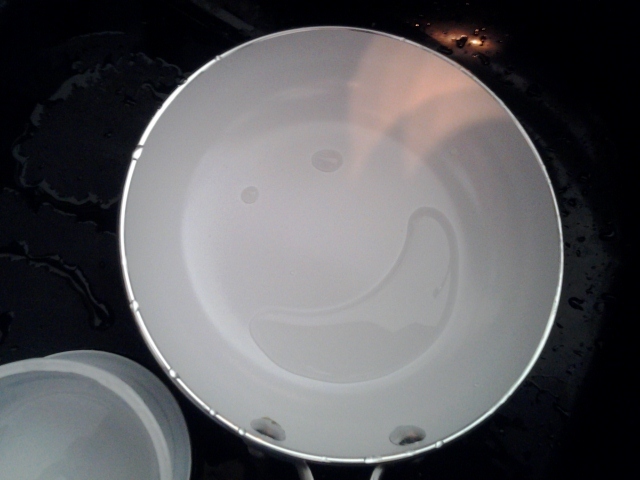 I reached to pick up a skillet in the sink and it was smiling at me! Water in the ceramic had beaded itself into an amazing smiley face. I smiled back; my eyes misted and I relaxed, knowing my prayer was heard and my anxiety was understood. Life is always full of uncertainty. Sometimes we feel it more than other times but even when we think we have life all under control, upheaval is coming. We have to learn to deal with the tumult. We got the house! There are moments when I start to panic, wondering if we made the right choice. Then I remember the smiling skillet. This entry was posted in Short Takes on Life and tagged anxiety, buying and selling a house, how to deal with stress, reassuring smile, smiley face, tumult, worry. Bookmark the permalink. His wonders to perform. Everyone should have a smiling skillet. So glad you are managing the tumult, girlie! cute blog. Great story Janet. I am so happy for you and I love the ways that God lets us know he is there and in control. P.S. Can’t wait to hear more about it.